Song begins with 3 or 4 shrill, slurred notes followed by a brief, rapid jumble. Description: Sexes similar. 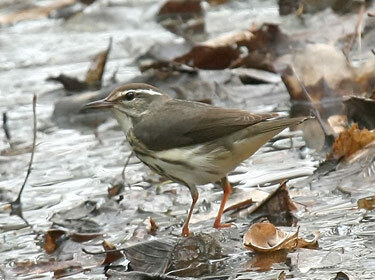 Olive-brown above; white underparts with contrasting buffy flanks; dark streaking on underparts; whitish eyebrow with pale buff in front of eye, much wider behind eye; bubblegum pink legs; has a larger bill than Northern Waterthrush. Behavior: Forages on the ground; walks rather than hops, and bobs its tail constantly but usually slowly. 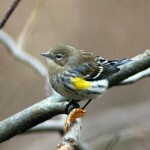 Habitat: Forested hills and ravines near fairly fast moving streams. 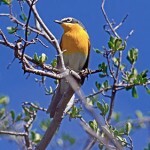 Where in Nebraska: Rare to uncommon spring and fall migrant in southeastern Nebraska, becoming rarer to the north and west. No evidence of current breeding in the state. 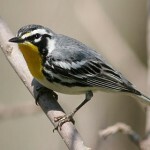 Fun Facts: The Louisiana Waterthrush wags the entire back half of its body and tail up and down while walking.